The U.S. Food and Drug Administration announced Wednesday it is escalating its fight against what Commissioner Scott Gottlieb is calling an epidemic in the use of e-cigarettes or vaping by children, demanding that manufacturers show how they will restrict sales to minors. Just this summer, the agency embarked on what it called the "largest coordinated enforcement effort in the FDA's history" when it issued 1,300 warning letters and fines to retailers — both traditional and online — that illegally sold the nicotine-delivering gadgets to minors. "We cannot allow a whole new generation to become addicted to nicotine," said Gottlieb in a news release. The agency plans to revisit a policy that gave manufacturers of e-cigarettes — which come in youth-friendly fruit and candy flavors — more time to apply for pre-market authorization. The policy allowed those products already on the market as of August 2016 to continue to be sold until at least 2022, without filing new applications and undergoing a public health review by the FDA. It also demanded that manufacturers provide plans within 60 days showing how they will keep their products out of kids' hands. The five top-selling national brands — Vuse, Blu, Juul, MarkTen XL, and Logic – make up 97 percent of the U.S. market for e-cigarettes. If the companies fail to provide a plan, the FDA may start removing products from the market, Gottlieb said. In 2017, more than two million middle and high school students were found to have been using e-cigarettes, according to a National Youth Tobacco Survey. Though many students think vaping is harmless — or at least a lot healthier than traditional cigarettes — scientists have found the developing adolescent brain is particularly vulnerable to nicotine addiction. "Let me be clear that nicotine isn't a benign substance," said Gottlieb. "That's why we need a strong regulatory process that puts these new products through an appropriate series of regulatory gates." The announcement won approval by anti-smoking advocates, many of whom wondered what took so long. "The e-cigarette companies have been marketing to teenagers for years. We're pleased to see this change, but the FDA should have been using its regulatory power to stop it long before now, " said Thomas Farley, Philadelphia's health commissioner. The FDA's plan has the potential to make a major impact but only if there is quick follow-up, said Matthew L. Myers, president of the Campaign for Tobacco-Free Kids. "Today's announcement will represent a fundamental turning point if, but only if, the FDA formally requires all manufacturers to comply with these requirements" said Myers. He added that the FDA should reverse its policy and require e-cigarettes to undergo agency review now. Barbara L. McAneny, president of the American Medical Association, called for the FDA to prohibit the use of flavors that enhance the appeal of the products to youth. "Increasing the awareness of the harmful nature of these products and their addictive power is the only way to prevent another generation of Americans from developing nicotine dependence," she said. Gottlieb said the FDA will support the potential of e-cigarettes to help adults stop using traditional cigarettes, but not at the expense of children. Kevin Burns, Juul Labs' chief executive officer, said it was committed to preventing kids from using its products. "Juul Labs will work proactively with FDA in response to its request," Burns said. "Our mission is to improve the lives of adult smokers by providing them with a true alternative to combustible cigarettes." To make that point, the company has been running advertisements, including in the Inquirer, promoting the product for adults. But Burns defended the flavors, saying, "Appropriate flavors play an important role in helping adult smokers switch." The company was founded in 2007 by two Stanford University design students and has seen the use of its product skyrocket. 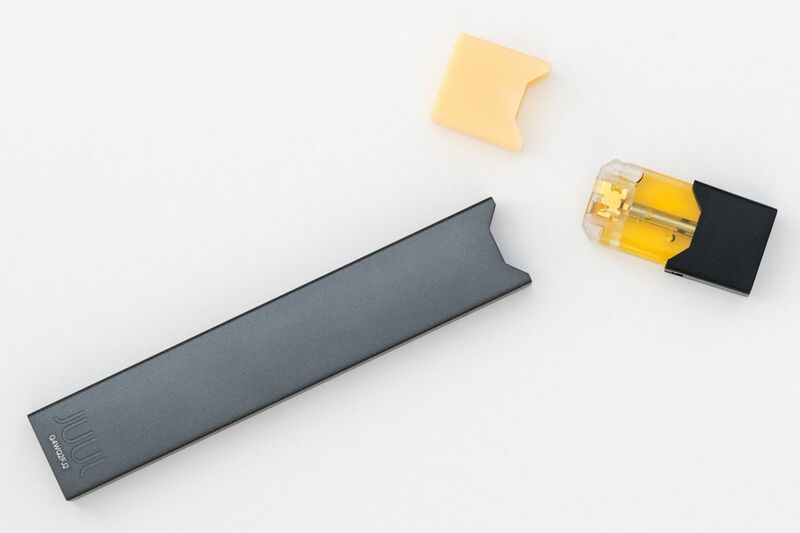 Juul has captured about 68 percent of the U.S. e-cigarette market and is valued at $15 billion, Bloomberg reported in June. The dramatic increase in use of Juuls by teens has left school officials scrambling to educate parents and kids on the potential health risks. The trendy devices can be purchased at gas stations, convenience stores, and smoke shops. Designed to look like USB thumb drives, Juuls can be charged on laptop computers. The devices, which contain flavored nicotine fluid, can be easily hidden in a teen's sleeve. Yet teens are often unaware that Juuls, and similar brands such as Myblu and KandyPens, contain nicotine and that it is addictive. In a recent study by the American Academy of Pediatrics, teens who smoke cigarettes or e-cigarettes are more likely to use marijuana than peers who shun the nicotine products. The FDA announcement comes at a time when the e-cigarette industry is facing recent court challenges and bans. In July, Israel decided to ban Juuls because of the high concentration of nicotine and the threat to public health. A class-action complaint was filed last month in Philadelphia federal court on behalf of four plaintiffs and others in Pennsylvania and New Jersey by users who claim the company has violated consumer-protection laws, engaged in deceptive marketing, and failed to include warnings about the level of nicotine the product delivers. A similar lawsuit was filed in New York in July.